Hacking tops of crape myrtles is commonly called “Crape Murder”. I have for many years advised against pruning of these ornamental trees and was one of the first to give advice of no pruning at all - even the tips and seed pods. One of my listeners years ago mentioned that small birds like to eat the crape myrtle seeds. She was right. On the other hand, there is another serious mistake made when planting crape myrtles. Almost all of them are planted too deep in the ground and the flares are covered with soil. Yes, we need to continue to educate landscapers and gardeners to stop “de-homing” the tops of plants, but more important to the long term health of the trees is to get the soil and mulch off the bases of the trees. 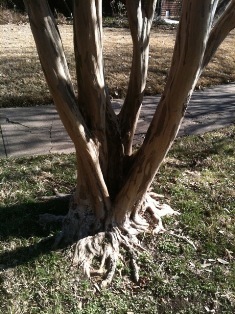 Crape myrtles have large beautiful trunk flares that expand into aprons with age. 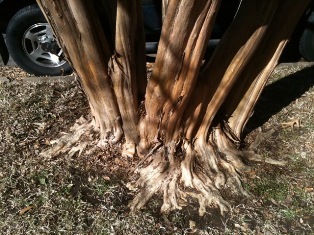 Proper root flare for crape myrtles.